February is a time for cupid, flowers, chocolates and winning! 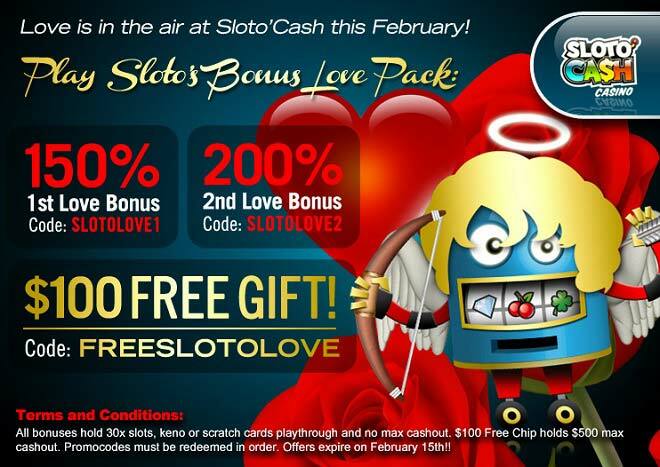 Get ready to spin the Sloto’Cash’s reels and fall in love with your favorite games all over again when you claim our set of bonuses + a $100 Free Gift! There’s no better time that now to cuddle with your favorite games – and cuddle and win you will when you claim a 1st 150% Match, continue with a 200% Bonus and top off the love with a $100 Free Gift! Kickoff the month of love with wins!